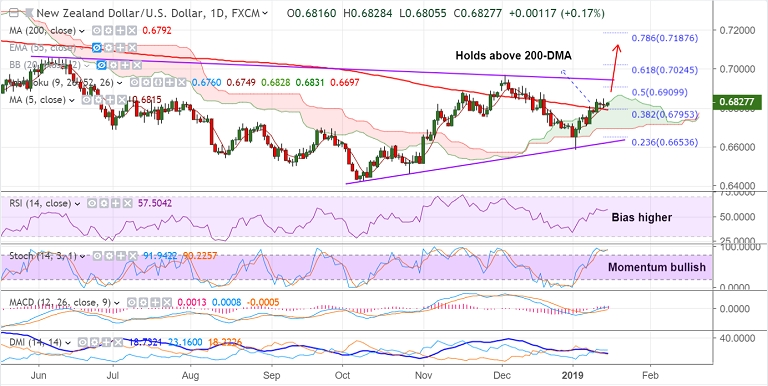 NZD/USD is trading in a narrow range on the day, holds above 0.68 handle. The major is extending consolidation above 200-DMA, momentum remains bullish. Antipodeans resilient on fresh monetary and fiscal stimulus measures announced by China. Momentum with the bulls. Stochs and RSI are biased higher. Scope for test of 0.69 handle ahead of 0.6969 (Dec 4th high). On the flipside, 5-DMA is immediate support at 0.6815. Retrace below 200-DMA will see weakness. Call update: Our previous call (https://www.econotimes.com/FxWirePro-NZD-USD-breaks-above-200-DMA-focus-on-US-CPI-data-for-further-impetus-1483077) is progressing well. Recommendation: Stay long for targets.